A PhillyVoice contributor on Thursday morning gave voice to those suffering in silence from a miscarriage or stillbirth. 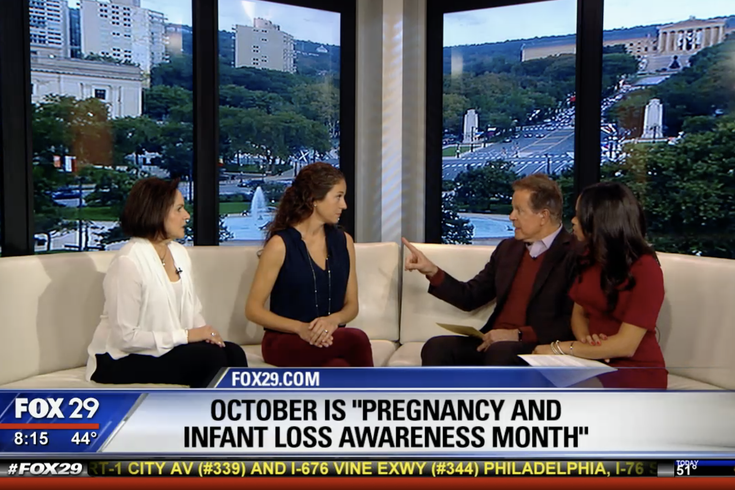 In an effort to break that silence, Katie Gagnon visited Fox 29’s "Good Day Philadelphia" show to share her own painful story during Pregnancy and Infant Loss Awareness Month. Earlier this week, Gagnon, who writes a column titled "Katie’s Baby," shared her experience with miscarriage with PhillyVoice readers on Monday, Pregnancy and Infant Loss Remembrance Day. A day earlier, she wrote, would have been her due date. She followed up on Tuesday with a column acknowledging that with one in four pregnancies ending in loss of the baby, it is time for people to begin talking openly about the under-discussed topic. Gagnon appeared on the morning show with Denise Paul, a local perinatal loss grief specialist, for a segment titled “Suffering in Silence,” a nod to the feelings that many women face after a miscarriage or stillbirth. Together, in a chat with hosts Mike Jerrick and Alex Holley, they aimed to promote discussion on this important issue. Telling her own story, Gagnon shared that she discovered that she lost a pregnancy at 11 weeks, during a visit to her doctor for an ultrasound with her husband and 18-month old son. After the doctor couldn’t find a heartbeat, and later discovered that there was no baby, Gagnon and her husband were heartbroken, but had to keep it together for their young son, who was growing worried. Gagnon later found out that she had experienced a "blighted ovum," which essentially means there wasn’t actually ever a baby, but her body was acting as if there was. Paul helps women cope with the deep feelings that result from the loss of a pregnancy. She said it is very common for miscarriages to be “swept under the rug,” with no discussion afterwards to give women a chance to mourn,. They are, in effect, forced to bear their grief in silence and alone. Both Paul and Gagnon encouraged women to remember and talk about their pregnancy loss, despite the difficult feelings it may bring up. In sharing her story, Gagnon said she realized that most of the women she knows share a similar experience, a revelation crucial to her own healing, as well as the promotion of this important topic. Women who have suffered miscarriage or stillbirth can receive support from UNITE, INC. – Grief support following miscarriage, stillbirth, or infant death, or Denise Paul, a perinatal loss grief specialist and therapist.